outside Union Station in Toronto, Ontario, Canada. Wandering the streets of Toronto during the day is the best way to discover the city's highlights. Architecture both old and new, monuments and sculptures, galleries, museums, and waterfront parks are just a few of the must see attractions in this great metropolis. 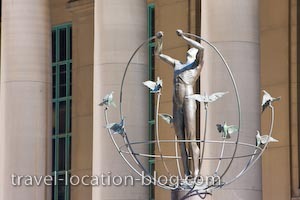 Union Station is situated at the heart of Toronto and is a hive of activity especially during the peak commuter times. Here you have two features: the architecture of the building itself and the monument to multiculturalism in Toronto and throughout Canada.